Ready to Hire a Camper Trailer? 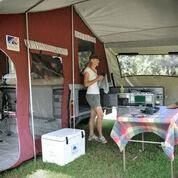 "If you're looking to get into a camper trailer for the first time, there's no better place to start" Our Camper Trailer Hire allows you to go anywhere in Australia. 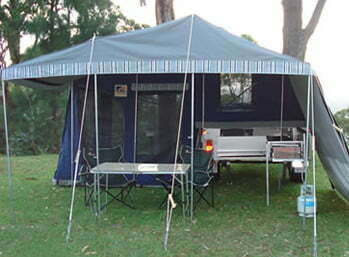 Our camper trailers are renowned for having a simple and reliable design that just works. Complete with all the features you would expect in this class including 9 leaf shackled springs, gas bottle, stove, water tanks and a great bed with easy access step. The big tent has a soft floor and a full annex. Our Camper trailers are rugged enough to take anywhere but easy to tow. Cooking facilities, Gas Bottle Supplied. Wash up tub. 60L water tank (hand pump on side of trailer) to be filled by the hirer. Battery system with sockets and LED lighting (supplied for inside the camper). C-Gear matting at the entrance to your Camper to keep it clean inside. Tarp, Broom, mop, dust pan and brush, chocks, fire extinguisher. When you pick up your hire Camper Trailer, our experienced staff step you through the process and demonstrate exactly how it is packed-up, set-up, hooked up, as well as how everything works. We also provide you with a basic guide just in case you need a little help when you get out there. Annex Walls, Sleepout (extra room), Fridge, Eskys, Kitchen Packs. $470.00 for a week 7 nights. Thinking about hiring? This is how easy it is to put our Camper Trailers up. See the next video for pack down. Packing up your Camper Trailer.